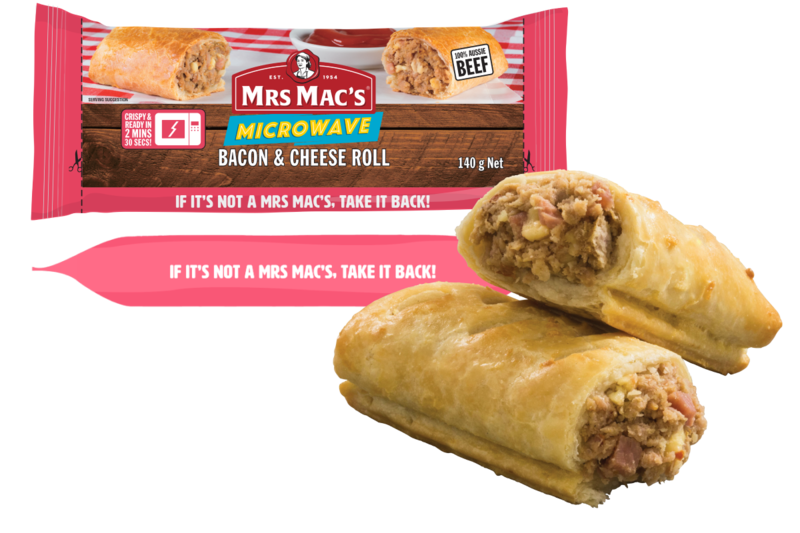 Made with 100% Australian beef with diced bacon and cheddar cheese pieces, wrapped in our golden pastry and crisped to perfection in the microwave. Made in Australia from at least 75% Australian ingredients. Wheat Flour, Water, Margarine [Vegetable Oil, Water, Salt, Emulsifiers (471, 472c), Antioxidant (304), Natural Flavour, Natural Colour (160a)], Beef (13%), Breadcrumbs [Wheat], Cheese (3%) [Milk], Bacon (3%), Seasoning [Wheat, Flavour Enhancers (621, 635)], Onion, Wheat Fibre, Textured Soy Protein, Flavours [Wheat, Flavour Enhancer (621), Soy, Colour (150c), Milk], Salt, Hydrolysed Vegetable Protein, Glaze [Milk, Natural Colour (160a)]. Cook on HIGH for 2 mins 30 secs, or until cooked through.